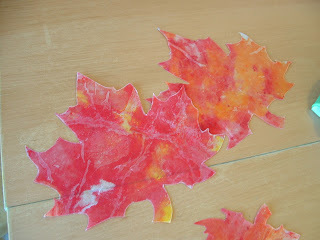 I saw this idea for fall leaves on V and Co a few days ago and LOVED them immediately. 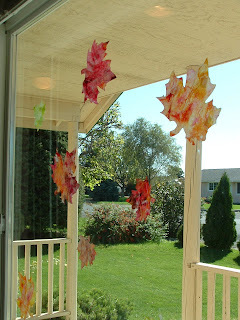 I've never been big into decorating for holidays because we've had really limited storage space and it seemed like a hastle...and kids get into the decorations so much. These were so pretty, though, and seemed like a tasteful way to decorate. They're also pretty out of the way since they're attached to the window. Firecracker said about a day after putting them up, "Mom, they look like they're falling because they're turned every which way!" And this is how they look from the outside at night. 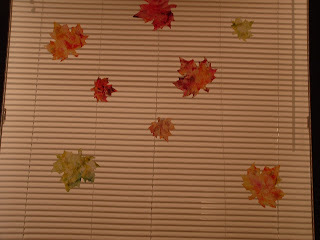 I did a mixure of colors, but for each leaf tried to stick to mostly two colors. Just about any two of the "fall" colors will work as a combination. I did make some green leaves since our leaves are still mostly green here, but starting to turn yellow. For those I did a green/yellow combination. I wouldn't recommend mixing the green with anything except yellow though. 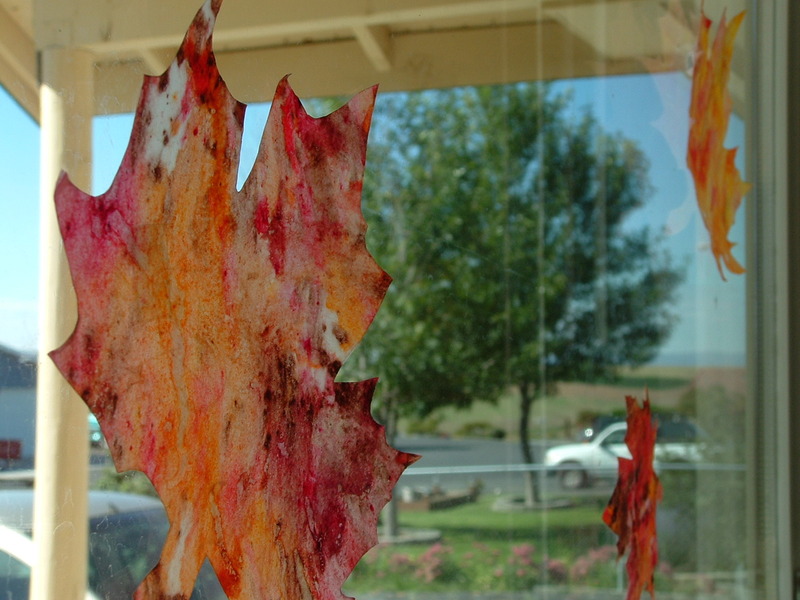 Some of the leaves have an occassional third color in for an accent. I love the painted look the melted wax gives, and am already thinking of some other similar projects. The instructions on V & Co are pretty good...obviously since I was able to follow them, but there was a little bit of a learning curve, so I thought I'd flush out the directions a bit here. 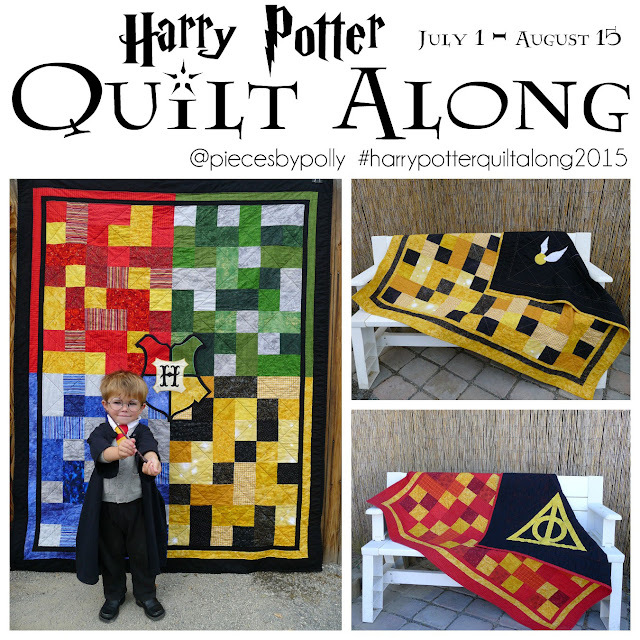 You'll want to go back to her original post, though, to get the traceable leaf pattern. I made two sizes. The small ones were traced directly from her post and the larger ones were traced from the screen you get when you click on the actual pattern. 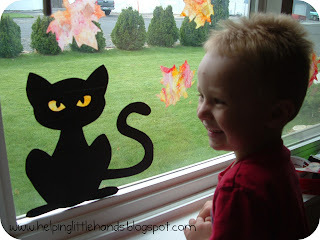 Also, I started out with high hopes of this being a fun kids craft. It really isn't...at least not for kids five and under. Firecracker had fun helping me make the crayon bits, but the whole rest of the process was slower paced than I thought it would be and she got bored. 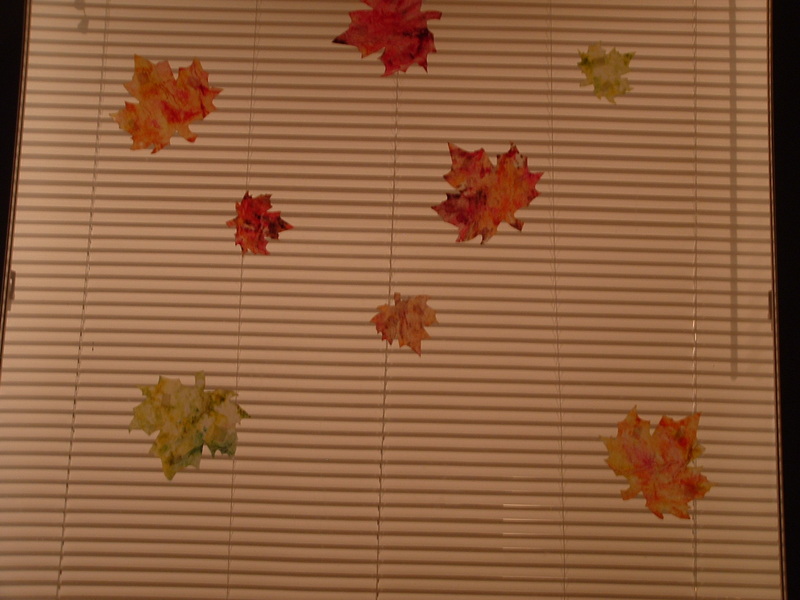 Also, her fine motor skills weren't really up to cutting out the leaves. 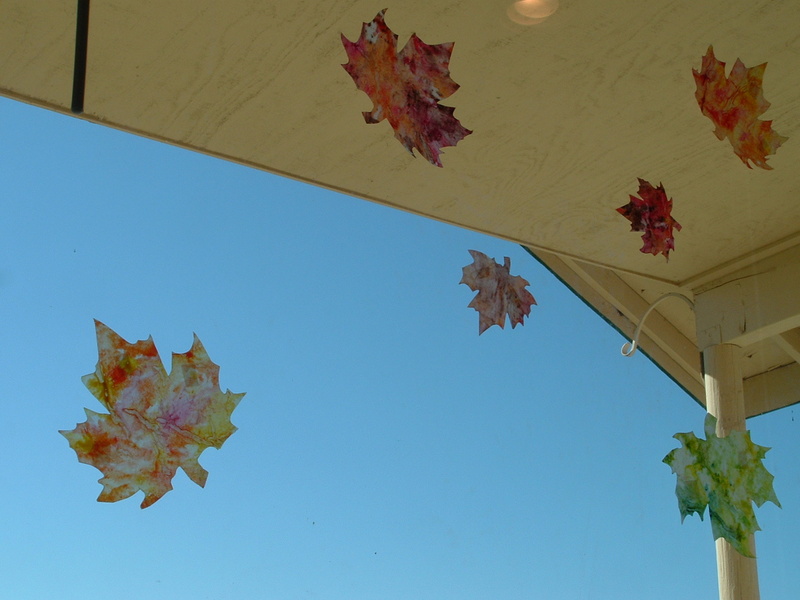 She did have fun helping me hang them in the windows though. You'll need to start with some old crayons. Shave them up however you like to. 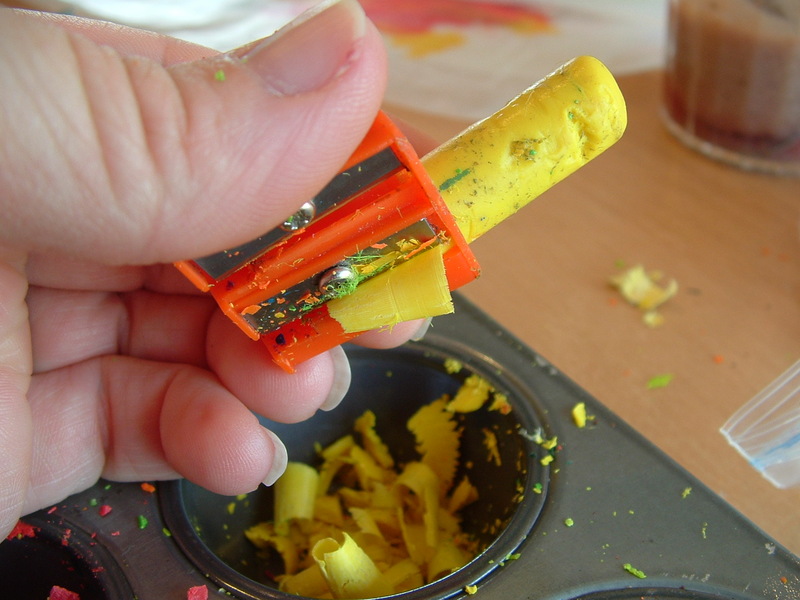 I found the fastest, easiest way was using a pencil sharpener. But for those littler bits that were too short for the sharpener, I scraped them to pieces with a knife. I kind of went overboard with the shavings. You don't need as many as I have here, but a muffin tin was a nice way to keep them seperated. Don't worry if a few random bits of color gets mixed up though, because I liked the look of the "mixed-up" spots in a few of the leaves. The original directions said to layer things this way on top of your ironing board...towel, wax paper, crayon bits, wax paper, paper towels, then iron. I would recommend some added protection for your towel and iron, though...because the crayon actually leaks through the wax paper. Start by putting a towel on your ironing board to protect it. I would also be sure to use an old and/or dark towel to start with, because some of the crayon is likely to get through to it anyway. Then I would put some paper towel on top of that to protect your towel (but some will still might get through.) 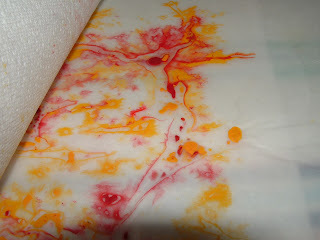 Then a sheet of wax paper. 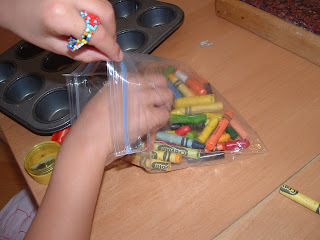 Then do an little additional crumpling of the crayon as you put it on your wax paper. 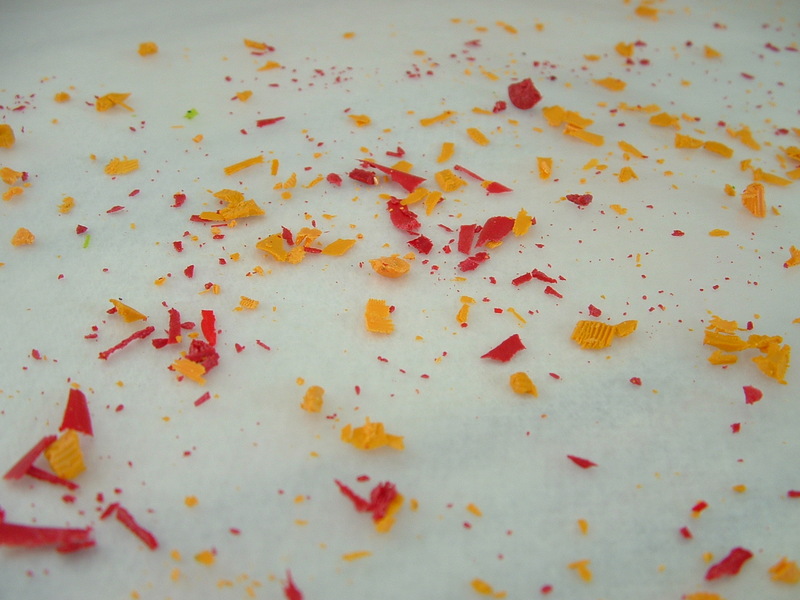 You want a pretty even distribution, but not too much because the melted wax will spread out quite a bit. Then you put your second piece of wax paper on top of that. Then I used a double layer of paper towels. Then I ironed it. When I first ironed it, I just kind of did it slowly all over and was quite dissapointed to see that mine looked nothing like the pretty ones in the examples. 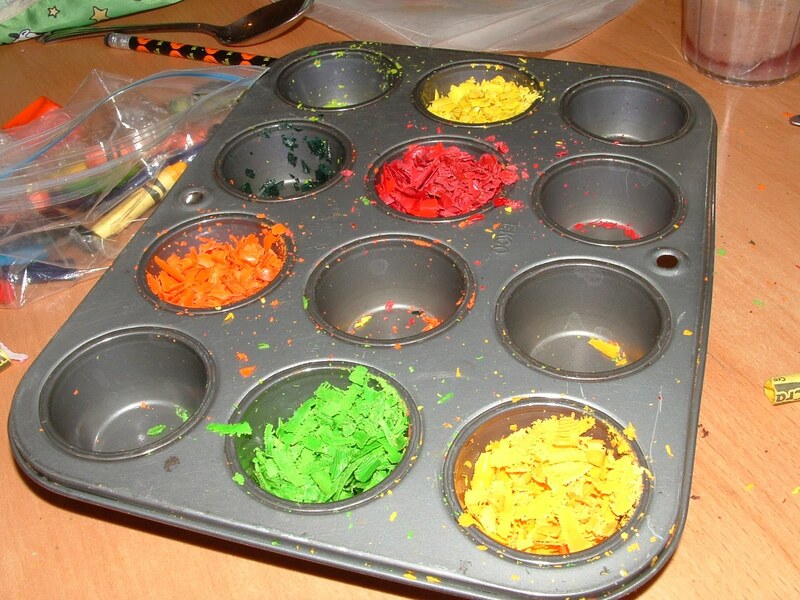 Mine looked like this...not exactly as spread around and bright as I was thinking they would be. Then I want back and read more carefully that you have to squish the wax around yourself...the iron alone is not enough to do it. I found it worked best to iron in sections. 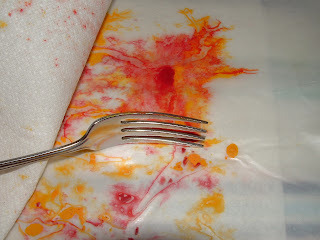 I'd iron one part to melt the wax, then move the iron to another part of the sheet to melt that wax, while I squished the melted section around with the flat side of a fork. 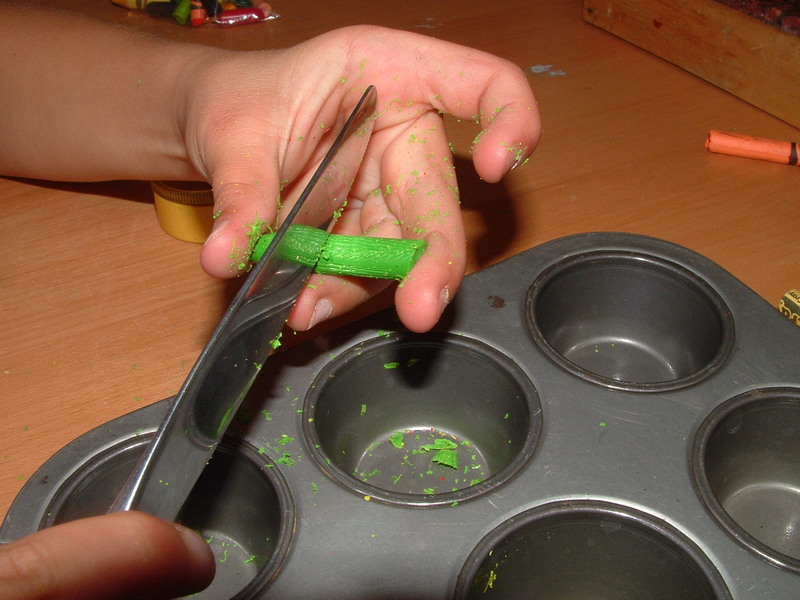 You only have a minute or two to move the melted wax around before you need to remelt the wax. Eventually you should get something that looks like this. 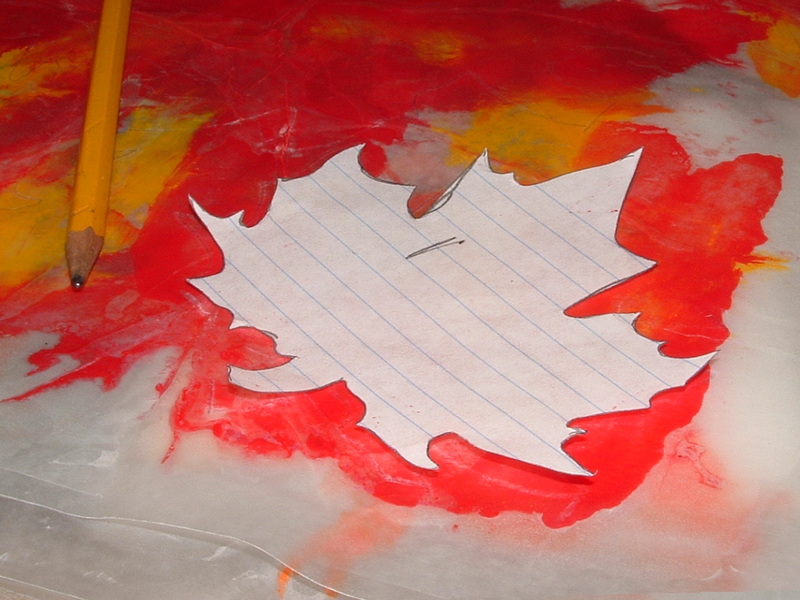 Then I traced the leaf pattern on with a pencil and cut them out. Then have fun hanging them up with your kids. 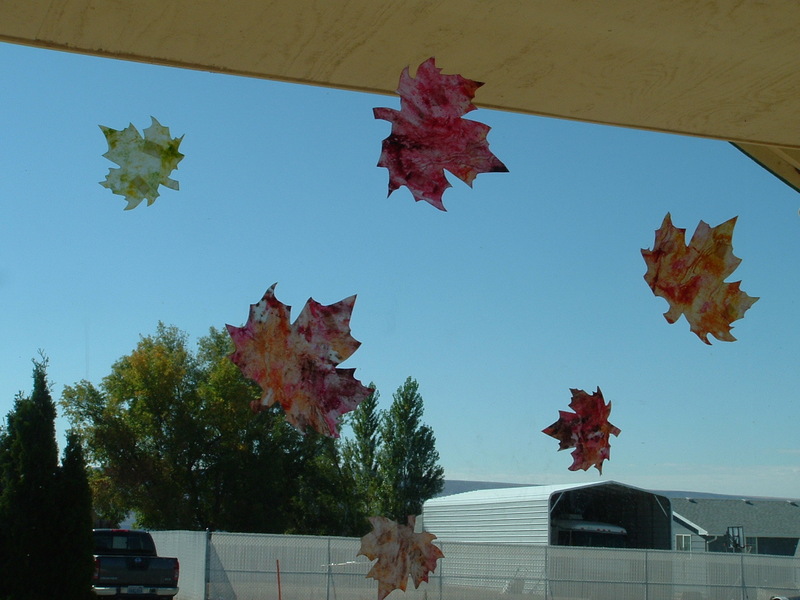 We did this after going on a leaf hunt and reading a book about trees...although the leaf hunting for colored leaves will be better in a few weeks. The book we read was Have You Seen Trees by Joanne Oppenheim, but I've got some more leaf books on hold at the library and have a few more kid-friendly projects planned. Note: I've been doing some additional projects with the scraps from this one. 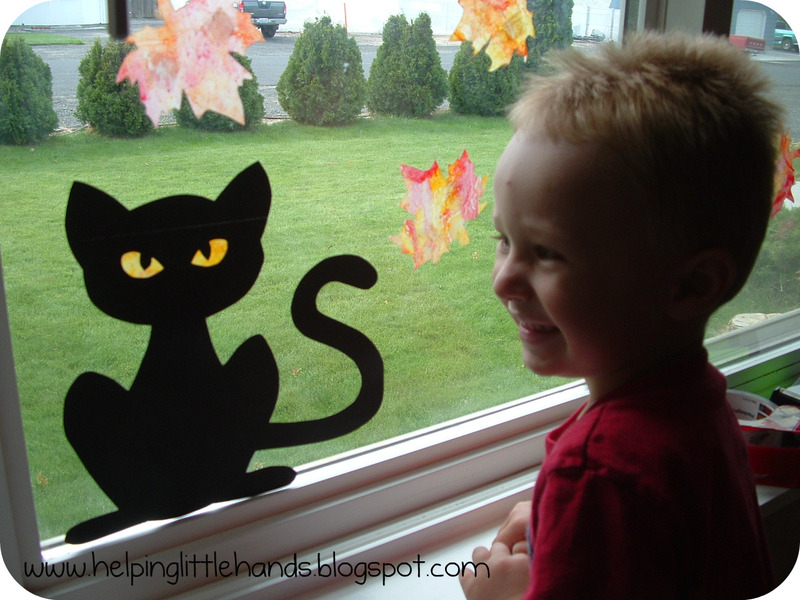 Get the pattern for this Halloween cat with glowing eyes here. 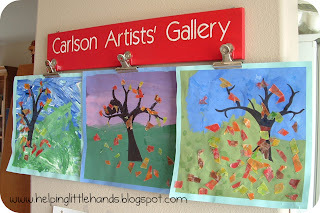 And directions for these kids' fall trees paintings here. Very pretty...what a good idea to tie them in with a book for the kids. 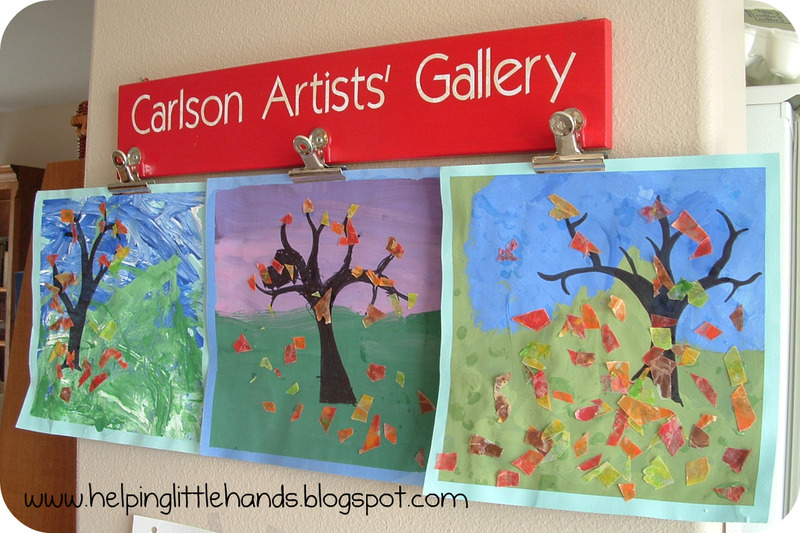 I did something similar when I worked at the preschool, but I really like how this turned out. They're so beautiful!!!! Very pretty! 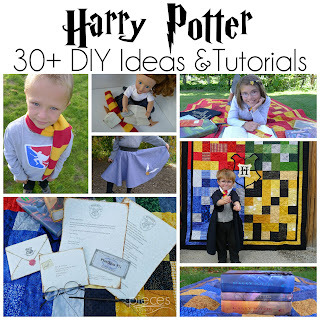 What a fun and pretty project!